The VMware Certified Advanced Professional 5 – Data Center Administration (VCAP5-DCA) exam will be retired on June 2, 2016. Today, I have published the final section of the VDCA550 exam Study Guide. The complete guide can be found here. Almost there, sections 1 – 5 are now available for download. With some delay, I published the third section of the VDCA550 exam Study Guide. Published the second section of the VDCA550 exam Study Guide. Published the first section of the VDCA550 exam Study Guide. Currently working on a Study guide for the VDCA550 exam. Although the existing posts cover almost all objectives (in a different order), one piece is missing. The vCenter Orchestrator has returned in this exam. So I published a post on Objective 7.2 “Utilize basic workflows using Orchestrator”. You can find the post here. Read my post that explains the differences between the VDCA510 and VDCA550 exam. A few weeks ago, Trainsignal has released a new course “VMware vSphere Optimize and Scale (VCAP5-DCA)”. This course is ideal as a preparation for the VCAP5-DCA exam. You can find more info on the course here. There have been a major revision in the section “Add/Remove target servers” in my post on “Objective 8.2 – Administer vSphere using the vSphere Management Assistant”. I highly recommend re-reading this section. It took some time to finish the last post in this series. The complete VDCA 510 exam guide has been made available for download. An overview of the web pages of the VDCA 510 exam. It has been a while that I have added an entry in this section. The last four months, I have been very busy working my way through the Blueprint with lots of reading, writing, publishing posts and especially performing exercises in my home lab. I scheduled my exam on October 9th. A few days before, I stumbled on this excellent post by Tim at Whiteboardninja. Tim’s Testing Strategy was very useful while doing my exam. As you probably know, the actual exam comes in the form of a live lab environment. I was very uncertain about the performance of the environment, as I have heard some serious rumours. So, I was very surprised that the environment actually worked pretty well, with very acceptable delays. If you are familiar with most of the objectives, it should be possible to schedule your exam and score an acceptable result. During the exam, my biggest challenge was the clock that was ticking in the on my monitor. I could have used at least an extra 30 minutes to complete all the questions. When your exam is over, you will receive an Examination Score Report that tells you: “You will receive your re-score results in approximately 15 business days after you have completed your exam”. After 11 business days, I have received an email from VMware that told me that I have passed my exam. So, what is next? I still have to publish 3 Objectives. Writing is almost done, so it won’t take long before you can read these. Further, besides having VMware certifications, I also hold Microsoft and Linux Certifications. Sometimes, it feels like being a juggler keeping all balls up in the air. First I have to renew Microsoft Certification, but VCAP5-DCD is certainly on my shortlist. With the introduction of vSphere 5.1 it is definitely that VMware is moving from Virtualization to Cloud Infrastructures. Well, a few days after submitting my VCAP5-DCA Authorization Request, I received email from VMware confirming that I have met the prerequisites and was now authorized to take the exam. If you are new to the VMware Advanced exam program, you will need to add the “VMware Advanced” program to your Pearson VUE account. A final notice states:There is a lot of interest in this updated version of the live lab and you may initially have difficulty finding a testing slot. Please be patient and keep trying. Although, my intention is to take the exam early October 2012 (Yes, I need some time to prepare…). So, I logged in to PearsonVUE, to find out that that it was not too difficult to book the exam on my preferred day and time. Oh, final remark, the exam is not very cheap, for me living in the Netherlands, EURO 368,90 VAT included. 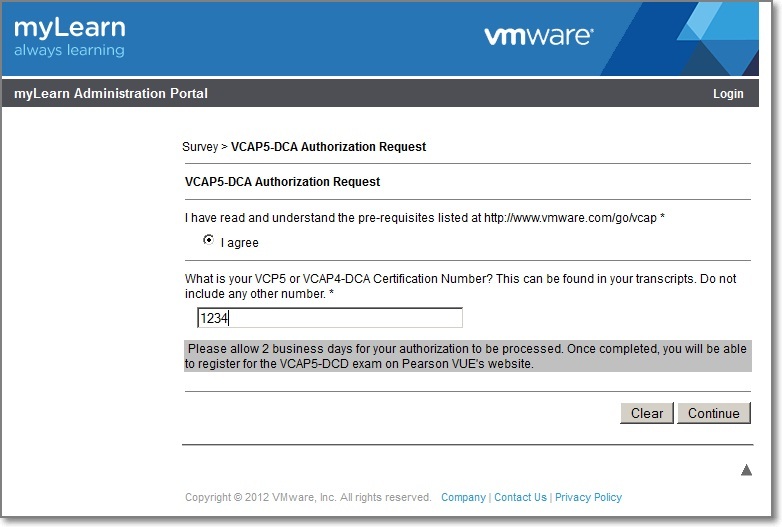 Well, I was a bit premature… On 9-7-2012, VMware announced that the VCAP5-DCA exam is now available. See posting in the VMware Education and Certification Blog. There is no mandatory course requirement, although VMware recommends to take the “VMware vSphere Optimize and Scale (V5.x)” course. This also means that the first public Exam Blueprint is available. The exam consists of a short pre-exam survey of 9 questions and 26 live labs (which is much less questions than the VCAP4-DCA exam). Each live lab consists of multiple tasks. There is a passing score of 300 on a scale ranging from 100 to 500. Points are awarded based on successful completion, not on the steps used to complete the task. The total time for the exam is 210 minutes, an additional 30 minutes if you take the exam in a country where English is not the primary language (like the Netherlands…). Plus an additional 15 minutes for survey and agreements. That makes a full 4 hour! The exam is administered through Pearson VUE. It is a live exam, you will be connected to VMware equipment. For that reason you can only be seated not more than 15 minutes before and 45 minutes after the scheduled time. The VMware equipment consists of two ESXi hosts and a vCenter Server virtual machine. A number of pre-configured virtual machines will also be present for use with certain tasks. The lab environment is based on vSphere 5.0. The VDCA510 exam includes troubleshooting tasks. As a result, some components may not be correctly configured, or may not have been configured at all, which is entirely intentional. VMware will provide a mock exam for the VDCA510. The mock exam simulates a sample question and lab activity similar to the type of questions and activities found on the exam. Before taking the exam, you need to process a VCAP5-DCA Authorization Request. First let us see if the objectives in the Exam blueprint have changed. TIP: Chris Wahl, over at http://wahlnetwork.com created a nice VCAP5-DCA study sheet. It makes it easier to follow your progress on your way to certification. You can download it here. Despite the announcement that the VCAP5-DCA exam will be launched in Q2, 2012, until now nothing has changed. Rumours are that the exam will be launched at VMworld 2012? Today, I have made some changes to this page, added the Objectives (Concept) and the links to the posts I have already published. All Objectives to 3.2 have been finished, but I need some time to publish these. Since my last update, a few things have changed. The Certification Section of the VMware website has announced that the VCAP5-DCA exam will be launched in Q2, 2012. Well, that should be within a few weeks. Based on the preliminary Exam blue print, I am putting together my own Study Notes (Here is an example). Although a lot of the Exam objectives have not changed from the previous version, on some points, vSphere 5 has undergone some subtle changes. Imho, the official VMware documentation is of good quality. Most Exam objectives can be found in the VMware Guides. For that reason, for each objective, I have added references to the official documentation. I also borrowed some text (thank you very much VMware). Extra references are a good thing, too many references get you off track. The big question is “How to prepare for the VCAP-DCA exam?”In this post I will mention a few. The main guide while preparing is the official VMware Exam Blueprint. You can find the latest version on VMware website under “Services” and “Certification”. The VCAP5-DCA Blue print is currently in Beta, that means; not available for the most of us. To get an idea download the latest version 4 here (you have to provide credentials). Be aware that Exam Blueprint will be updated from time to time, so check for a newer version now and then. An excellent and colourful reading on the changes in the Exam Blueprint from Edward Grigson. While reading the Exam Blueprint, you will notice this exams differs from the VCP exam as it mainly consists of live lab activities. To prepare for the VCP exam, some kind of lab environment was highly recommended. In my opinion, for this one, a lab is a must have. In the Blogging sphere you can find a lot of info on building a home lab. To take the VCAP5-DCA exam, you have to be VCP5 certified. For those already VCAP4-DCA certified and not VCP5, there is a grace period. Unlike people taking their first VCP exam, there are no mandatory training courses required. and Automation with vSphere PowerCLI. The number of courses for the VCAP5-DCA exam seems much smaller. In my opinion. Most of the above mentioned courses are also for the VCAP5-DCA of great value. Following all these courses will cost you or your boss quite a lot of money, luckily there are alternatives. Over the years, Trainsignal has produced a large number of good and affordable VMware Training Videos. The VMware vSphere 4 VCAP Training Package combines four training videos; Troubleshooting, vSphere PowerCLI, Performance Monitoring and Security Design. I have followed all these training courses besides some other courses presented by Trainsignal. I regard these courses as good value for the money, especially the vSphere Troubleshooting Training. And No, I repeat No, I receive no money nor free training videos from Trainsignal and they do not sponsor my blog as you can see. Another valuable source of information are study guides. Based on the Exam Blueprint, several people have spent a lot of time, and created Study Guides, each objective contains useful information and/or links to even more info on the subject. To name a few; Edward Grigson at www.vexperienced.co.uk and Sean Crookston. Edward has already started updating his Study Guide to version 5. Books? The Official VMware Product Documentation contains a lot of useful information. With vSphere 5, VMware has split up the guides in even more categories. For instance the “vSphere Storage Guide” and the “vSphere Auto Deploy Guide” contain detailed information. These and other guides can be found here. Last year I have read Duncan Epping and Frank Denneman “VMware vSphere 4.1 HA and DRS technical deepdive”. With vSphere 5 came a complete revised edition “VMware vSphere 5 Clustering technical deepdive”. These books are worth reading. Preparing for an exam does cost a lot of time. I always try to reserve time for study, so it is a scheduled activity besides having a job, spent time with family, friends and other activities like sports. Until fall 2010, the most common way to get certified for VMware products, was to take the required course, pass the exam and become a VMware Certified Professional. Going for the next level in certification, was a big step and is called VCDX certification. To close the gap, two new certifications were launched, the VMware Certified Advanced Professional (VCAP). This certification comes into two flavours; VCAP-DCD, Datacenter Design and VCAP-DCA, Datacenter Administration. So early 2011, I started activities to prepare for the VCAP-DCA exam. To honour an old saying; It is not only passing the exam, it is also about going the road that leads to the day you will take the exam. In other words, I believe in a thorough preparation. More about that later. Then, in July 2011, vSphere 5 was announced and released one month later. To keep up to date and explore the new functionality, I spent quite a lot of time, reading documentation and blog posts. Also my home lab needed an upgrade and I prepared taking the VCP 5 exam before the end of February 2012. Then came the first rumours about a new VCAP5-DCA certification. So my idea was to continue my preparations towards this new version. This week, two posts confirmed that the VCAP5-DCA exam has reached Beta. Both posts contain a lot of useful information, mainly based on the new Exam blueprint. Links to TheSaffaGeek and the Wahl Network. Especially TheSaffaGeek presents a good overview of the differences with the previous version, I will not repeat these. On the VCAP5-DCA Diaries, I will frequently blog about my progress and add useful information and topics as I come across. Thanks for the mention about my VDAP5-DCA Testing Strategy post. I am glad that it worked for you, and hopefully more people use it to gain the certification. Just wanted to say thank you for putting together this awesome guide and provide a success story. I studied this (and the guide from Josh Coen and Jason Langer) thoroughly and just got my exam report back. Passed 🙂 Very, very thankful for all of your hard work that went into this guide. Big Congrats on passing your VCAP5 DCA exam and thank you very much for your feedback. I Really appreciate it. Paul, thanks a lot for this great guide, it helped me very much. I was evaluating most of the study guides out there, but yours suited my needs best. I passed easily the exam and I’ve recommended your guide to all my colleagues and recently on my blog also. Keep up the good work on your V for Virtual Blog (nice name).